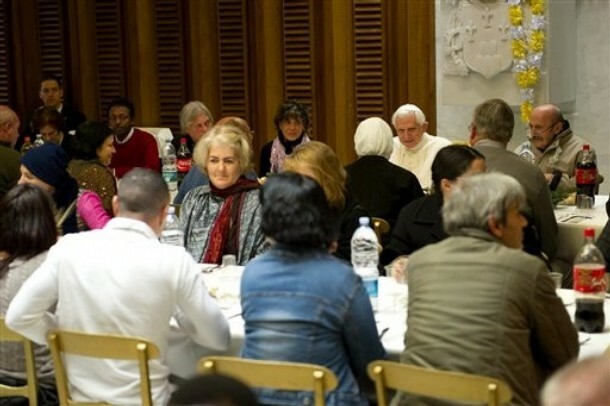 To mark the 100th birthday of Blessed Teresa of Calcutta -- and keeping with this pontificate's preference for acts of concrete charity at Christmas -- earlier today B16 hosted a lunch for some 500 of Rome's neediest served by the shelters and kitchens of the Missionaries of Charity, the Indian-based community founded by the universally-beloved Nobel Peace laureate, the "Saint of the Gutters." 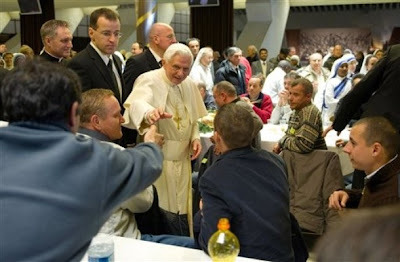 Held in the packed atrium of the Paul VI Audience Hall -- the same spot where the Pope recently hosted lunches for the delegates to October's Synod of Bishops and, last month, the College of Cardinals -- likewise present with the throng were Mother Teresa's successor at the MC's helm, Sr Mary Prema, and Fr Sebastian, the superior of the order's community of men. Of the large group, fourteen guests of the shelters joined the pontiff at the head table. To the whole room, however, Benedict delivered the following remarks, here below in a house English translation. I'm very happy to be here today with you, and I extend warm greetings to the Reverend Mother-General of the Missionaries of Charity, to the priests, sisters, contemplative brothers and and all of you here to enjoy this brotherly moment together. The light of the Lord's Birth fills our hearts with the joy and peace announced by the Angels to the shepherds of Bethlehem: "Glory to God in the highest, and on earth peace to those whom he loves." The Baby that we see in the manger is God himself who made himself man, to show us how much he desires our good, how much he loves us: God has become one of us, that he might make himself close to each of us, that he might conquer evil, liberate us from sin, give us hope, that he might tell us that we are never alone. We can always look to Him without fear, calling Him Father, sure that in every moment, in every situation of life, even the most difficult ones, He never forgets us. May we say ever more often: Yes, God himself takes care of me, he loves me, Jesus was born for me, too; I must trust in him always. Dear brothers and sisters, clinging to the light of the Baby Jesus, of the Son of God made man, illuminates our lives to transform them in light, which we see especially in the lives of the saints. I think of the witness of Blessed Teresa of Calcutta, a reflection of the light of the love of God. To celebrate a hundred years since her birth is cause for gratitude and for reflection, that we might have a renewed and joyous charge toward the service of the Lord and our brothers and sisters, especially the neediest among us. As we know, the Lord himself wanted to be needy. Dear Sisters, Priests and Brothers, dear friends, love is the force that changes the world, because God is love. Blessed Teresa of Calcutta lived love for everyone without distinction, but with a preference for the poorest and most abandoned: a luminous sign of the fatherhood and the goodness of God. She knew to recognize in each person the face of Christ, who she loved with her whole self: the Christ who she loved and received in the Eucharist she continued to find in the streets and pathways of the city, becoming living "images" of Jesus who crosses over the wounds of man with the grace of his merciful love. Whoever asks why Mother Teresa became so famous, the answer is simple: because she lived in a humble, hidden way, for love and in love of God. She herself affirmed that her greatest prize was to love Jesus and serve him in the poor. Her tiny figure, whether with her hands joined together or embracing a sick person, a leper, the dying, a child, is the visible sign of an existence transformed by God. Amid the night of human suffering, she became resplendent in the light of divine Love and helped so many hearts find the peace only God can give. Let us thank the Lord, that in Blessed Teresa of Calcutta we all have seen how our existence can change when it encounters Jesus; it can become for others a reflection of the light of God. To many men and women, in situations of sorrow and suffering, she gave consolation and the certainty that God doesn't abandon anyone, ever! Her mission continues among many, here and in other parts of the world, who live her charism of being missionaries and missionaries of Charity. Our thanks to you is great, dear Sisters, dear Brothers, for your humble, discreet, almost hidden presence in the eyes of men, but extraordinary and precious to the heart of God. To man often in search of happy, fleeting illusions, your witness of life says where true joy is found: in sharing, in giving, in loving with the same generosity of God that destroys the logic of human selfishness. Dear friends! 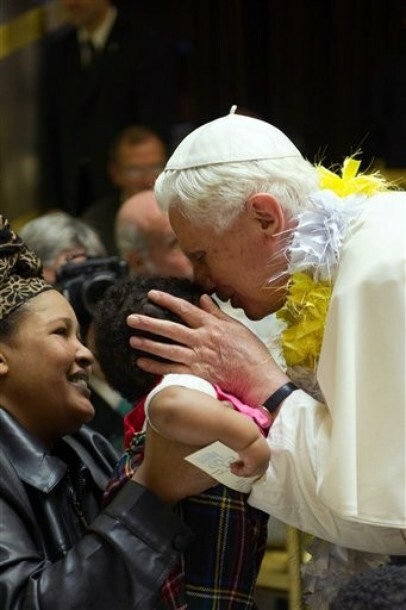 Know that the Pope loves you, carries you in his heart, brings you all close in a fatherly embrace and prays for you. Every wish for a Merry Christmas! Thank you for wanting to share the joy of these feast days with me. I call upon the maternal protection of the Holy Family of Nazareth who we celebrate today -- Jesus, Mary and Joseph -- and I bless all of you and your dear ones.